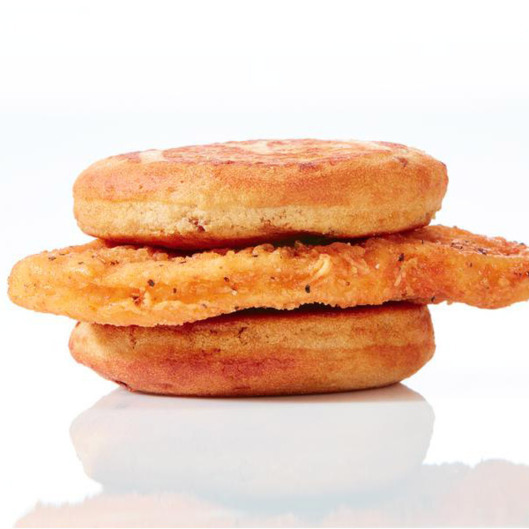 McDonald's announced on Wednesday that it will combine fried-chicken patties and those little syrup-infused pancake buns it uses for McGriddles to make a heretofore-unseen new breakfast sandwich, called the Chicken McGriddles. Now that McDonald's has gone all-in on all-day breakfast, the restaurants presumably have all kinds of new ingredients sitting around. That explains why McDonald's announced on Wednesday that it will combine fried-chicken patties and those little syrup-infused pancake buns it uses for McGriddles to make a heretofore-unseen new breakfast sandwich, called the Chicken McGriddles. Columbus Business First reports Ohio franchisee Brian Mortellaro, the dish's inventor, just did a bit of MacGyvering, since the chain's breakfast menu is waffles-poor. Still, making his new sandwich work doesn't sound like it was that taxing -- the only actual change it requires in the kitchen is serving the McChicken during breakfast hours. McDonald's trivia buffs will note that the Chicken McGriddles isn't an entirely new concept. It's a known menu hack, accomplished by adding a McChicken patty to a McGriddles of the customer's choosing. Also, a variant has been tried before in California, though the reception wasn't what you'd call warm, probably because execution was pretty third-rate. The sandwich is going to be tested through March 27 at Mortellaro's stores. If customers respond well, then the rest of central Ohio could get a larger run. Going national is no foregone conclusion, in other words, but the Big Mac and Filet-O-Fish got their starts as franchisee Frankenfoods, and Mortellaro would seem to have the Zeitgeist on his side. He rightly notes a viable fast-food version of chicken and waffles is just "something that isn't out there right now."